TF Magnus - functional template for Joomla 2.5, developed on the popular platform Gantry Framework. 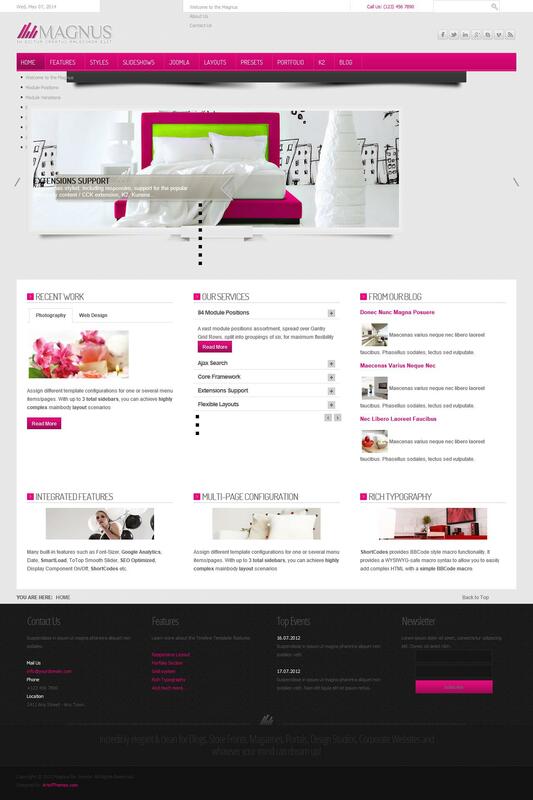 This template includes the best solution, allowing to create a website of any subject and complexity. In the assembly of integrated universal expansion Widgetkit, RokSprocket and K2, which provide flexible management of site materials. Just in the template has built support forum on the basis of Kunena component with theme from the corresponding overall site design. Design layout contains 10 color schemes, there are more than 80 module positions, 9 variations modular, integrated menu system for easy navigation, and much more. Availability adaptive template function provides full support for tablet and mobile devices. TF Magnus perfectly optimized, has a fast loading and fully compatible with all browsers.